I've had a number of comments a few posts back on credit cards and the different rewards that they offer. I decided analyze what I think are some of the more commonly used credit cards. While I've analyzed 18 different cards, I am sure this does not cover all of my readers' cards. While your individual card may not be covered below, I believe that the message will be the same. You must spent a lot of money for these cards to be worthwhile. I've based the analysis on my average monthly credit card bill spending of $700. For each card analyzed I have also indicated a break even spending level. If we take TD's Gold Travel Visa as an example, an individual would need to spend $8,000 just to cover the cost of the annual fee. There are a number of limitations with the analysis. - The analysis excludes differences in the cards such as insurance coverage, flight change options, upgrade options, waived banking fees associated, free auto clubs with a particular card etc. While these may be very valuable to a frequent flyer, I feel that for the average consumer they are useless. 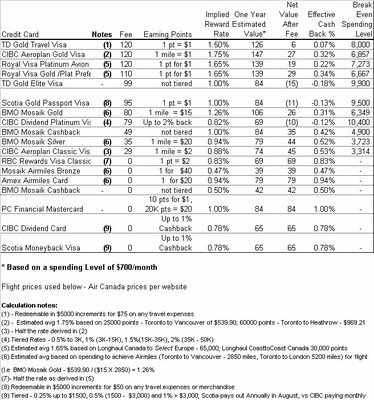 - Since many of the cards use a point system, I determined an implied rate using Air Canada flight prices published on their website. 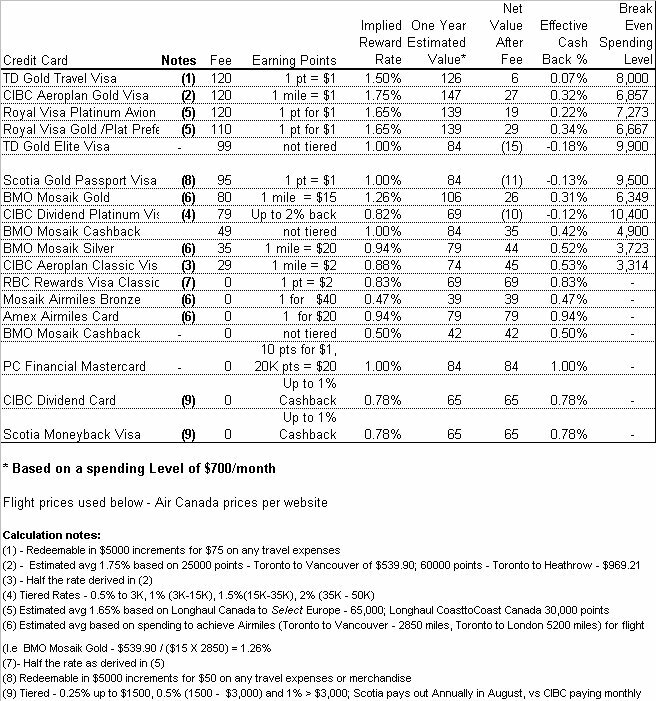 I took 2 September flights: Toronto to Vancouver($539.90) and Toronto to London, UK($969.21) as my base fare price and used these prices to calculate an average implied rate. How do your cards rate? My vote would be for the PC Financial Mastercard or the CIBC Dividend Card. While one reader pointed out that Loblaws is expensive and therefore the rewards for the PC card may have a lower value, No Frills is a cost-effective grocery store where points can be redeemed. I also rank the CIBC dividend card higher than Scotia's Moneyback card because of the monthly payouts vs Scotia's annual payout. Some of the other cards do have a higher rewards rate, but I personally prefer cash/near cash(groceries) than a travel reward. what about citibank enrich platinum card that gives 1% back on everything? up to 250 a year. i think it's great. Have you seen the new gas advantage card from canadian tire? If you spend 1000/per month on your credit card...obviously pay it off when it comes in you get 10cents off every litre of gas. That can end up saving 8 dollars a tank of gas plus a coupon for sobeys groceries. I put my fixed expenses, groceries, telephone, etc. on it. CapitalOne Platinum Mastercard also has a 1% cash back on all purchases. CIBC Dividend Card does tabulate your cashback accrued to date every month on your statement but actually only pays out once a year, on your December statement. RBC Rewards Visa also has another card where you earn 1 pt = $1 for a $35/year fee. So that would give you $106.12 actual value. Not bad eh? BTW the Driver's Edge card has no annual fee. Only significant catch is if you have balance, interest rate is high. They have to make money somehow right? This summer we saved ate 375 dollars worth of free groceries. Thanks PC mastercard. We pay for everything we can with it and pay it off monthly. I'm with Peter about the citibank enrich. 1% cashback, no fee, and purchase protection. My favourite card is the Costco Amex Platinum card. A maximum of 1.5% cash back in the form of a Costco gift check. My favourite card is still the PC MasterCard. Getting free grocceries is a great! It's getting free food which I need anyways from stuff that I need to pay for every month like phone, cable, gas, insurance, entertainment, etc. Having had an ongoing problem with CIBC Aerogold's Visa card (not being accepted for no good reason...and condescending calltakers)...I am considering applying for the Citibank Club Sobeys card, and having the points automatically transferred or converted to Aeroplan points. This is a Mastercard, though. Any thoughts on this move?